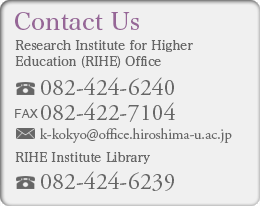 The following is the list of our programs granted KAKENHI, Grants-in-Aid for Scientific Research, by MEXT. Grants-in-Aid for Scientific Research are competitive funds that are intended to significantly develop all scientific research (research based on the free ideas of the researcher), from basic to applied research in all fields, ranging from the humanities and the social sciences to the natural sciences. The grants provide financial support for creative and pioneering research projects that will become the foundation of social development. The research projects are selected using a peer-review screening process (screening by multiple researchers whose field of specialization is close to that of the applicant). and another 76 grants for scientific research.